J. Palmer O’Neil, “Pirate King” and President of the Pittsburgh Pirates, chasing an elusive championship. 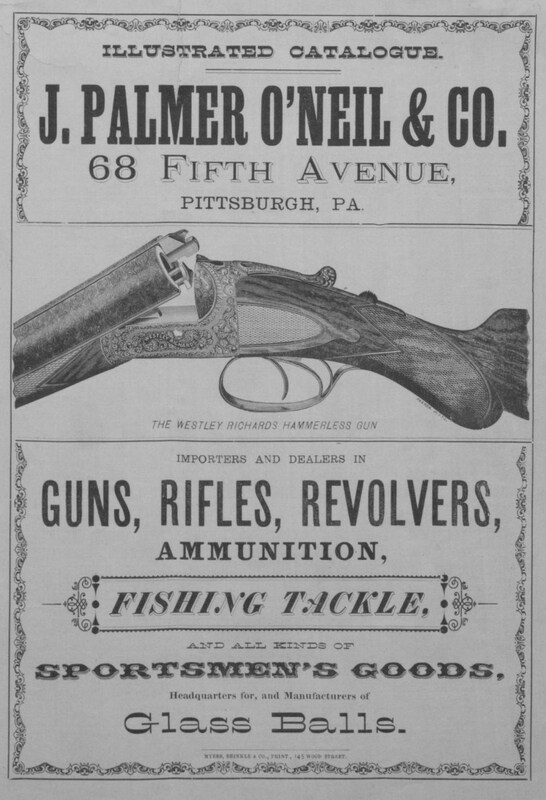 Pittsburgh Press, July 26, 1891, page 1. Most popular accounts of the origin of the Pittsburgh Pirates’ nickname trace the name to a decision of the board of arbitration for baseball handed down on Valentine’s Day, 1891. The decision gave some love to Pittsburgh, while denying it to the City of Brotherly Love, Philadelphia. The board had approved a contract (second-baseman, Lou Bierbauer, had signed with the National League’s Pittsburgh club) over the protests of the Philadelphia Athletics of the American Association (the second major league at the time). 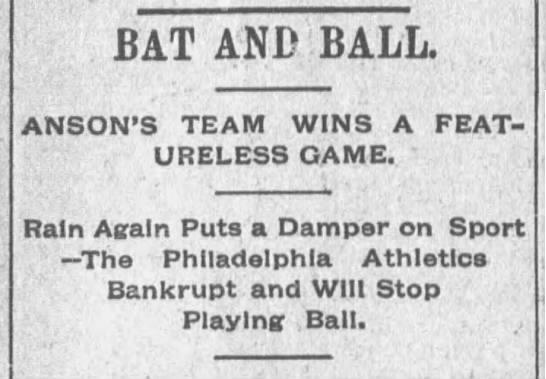 Philadelphia Inquirer, July 16, 1891, page 3. The popular story, however, is incomplete. While someone may have said something along those lines during the hearing, it would have been unlikely to result in the name “Pirates,” as applied to Pittsburgh alone. The same board handed down the same decision, in favor of a different team, on precisely the same facts, the very same day; Boston’s National League team had signed first-baseman Harry Stovey, who was likewise claimed by Philadelphia under the “reserve rule”, despite (arguably) not having complied with the necessary formalities. The Association men were incensed at this breach of faith, and when President Thurman, their member of the National board, voted against them and with the League, sustaining the piracy of the Boston and Pittsburg clubs, their rage knew no bounds. 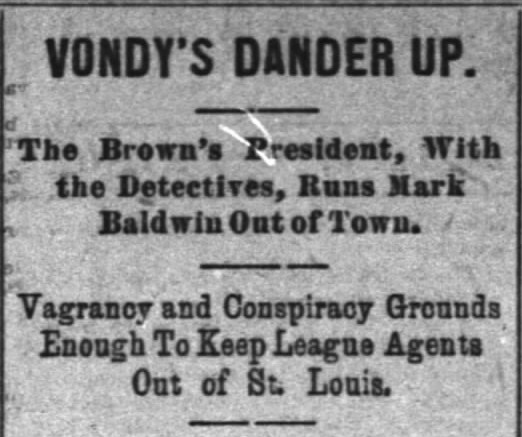 St. Louis Post-Dispatch, February 22, 1891, page 24. Bierbauer and Stovey were a piece of the story, but only a prelude. The name “Pirate” did not become permanently attached to Pittsburgh until a few weeks later, and then only after Pittsburgh had gone on a cross-country signing spree, signing four “contract jumpers,” players who were already under contract with American Association teams. 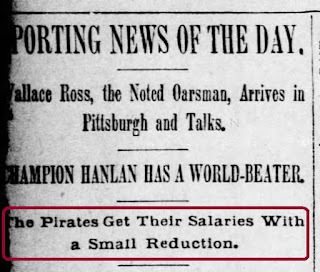 And there was no shortage of "pirates" in baseball at the time. 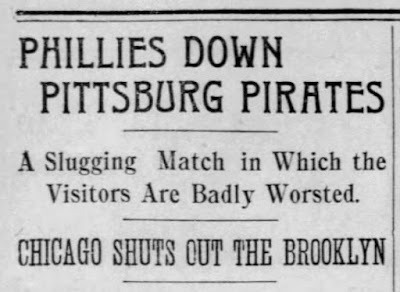 Ironically, a week before Pittsburgh signed its first "contract jumper," the American Association withdrew from the National Agreement in retaliation for the Bierbauer and Stovey decision, and set sail on a self-proclaimed course of piracy of its own against the National League. 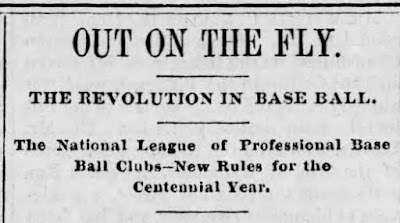 A special from Washington says: “We are pirates now,” remarked Secretary Kalbfus[ii] of the Association Club of this city, to-day, “and have hoisted the black flag against the National League for the good of base-ball. Our sole regret is that matters progressed so far that we signed a number of players for this season since the abrogation of the national agreement by the American Association will throw a number of players on the market. It is only a question now as to the salary to be paid, and we can go into the League ranks and pick out their men by making them good offers. The Cincinnati Enquirer, February 21, 1891, page 2. St. Louis Post-Dispatch, March 1, 1891, page 24. 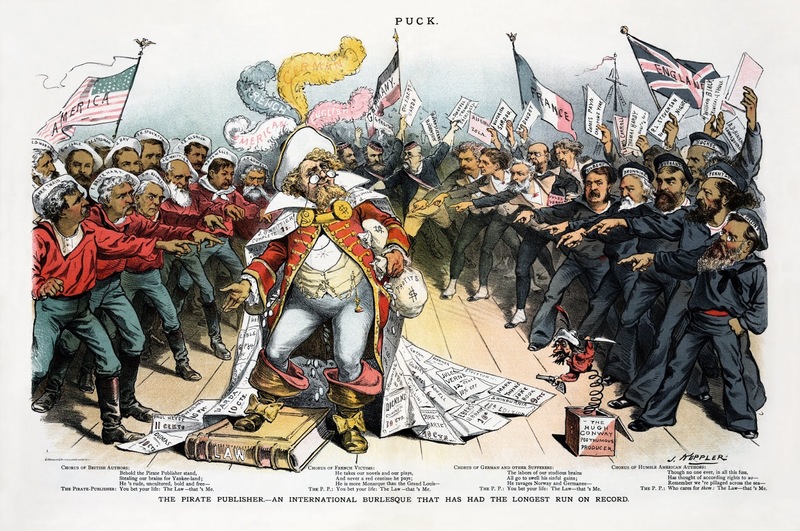 There is enough material lying around among the records of the musty past to furnish editorial ammunition for a whole winter’s campaign; and we’ll not be sparing in its use of the necessity arrives to defend the citadel of honest, legitimate, professional base ball against piracy and socialism. The Boston Globe, November 4, 1889, page 5. The full story features enough comedy, drama and excitement to fill Gilbert & Sullivan opera – crossing an icy lake in winter, false whiskers and disguises to avoid the police on an interstate train, a dragnet, an arrest, a kidnapping, and a seven-year lawsuit for false imprisonment. And at the precise moment O’Neil became the “Pirate King,” the name came, appropriately enough, straight out of a Gilbert & Sullivan opera – The Pirates of Penzance. 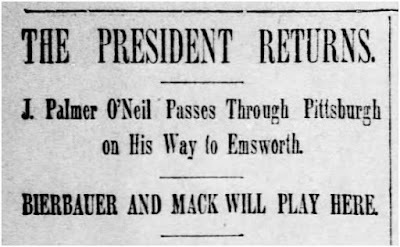 On March 3, 1891, J. Palmer O’Neil, President of Pittsburgh’s National League baseball franchise, attended a meeting of National League executives held in Parlor F of New York City’s Fifth Avenue Hotel. One of the items on the agenda was whether Pittsburgh could keep its four “contract jumpers.” Critics called it “piracy,” but the players claimed that the American Association breached the contracts first, by withdrawing from the “National Agreement” in protest over the Bierbauer-Stovey decision two weeks earlier. The New York World, March 4, 1891, page 3. 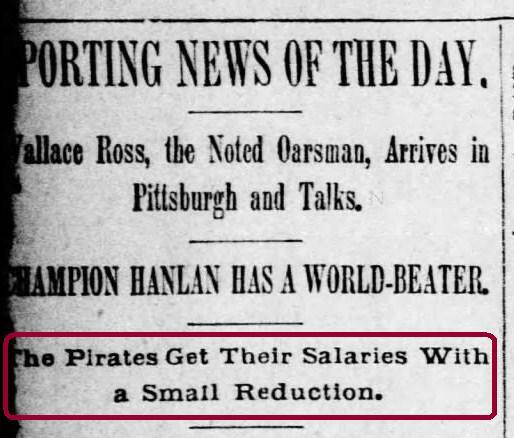 The report of the deal submitted by the “Pirate King” was not unanimously accepted by the League . . . .
St. Louis Post-Dispatch, April 5, 1891, page 22. It would be funny, indeed, if J. Palmer O’Neil’s Pirates and Cincinnati’s Reds should be found at the head of the procession pushing for big honors. Pittsburgh Daily Post, April 20, 1891, page 6. 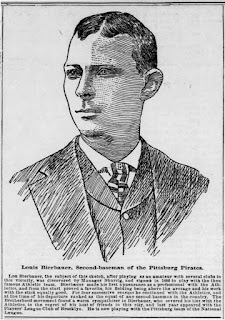 The Pirates’ synonymous nickname, the “Buccaneers,” even appeared in print before the team returned home from spring training. Pittsburgh Daily Post, May 2, 1891, page 6.
. . . the “Pirate King’s” forces and the forces of the chieftain of the West commenced hostilities. Pittsburgh Dispatch, April 23, 1891, page 6. Every pedestrian, from the banker to the bootblack, stopped to look into the faces of the Chicago team and to gossip on the result of J. Palmer O’Neil’s piracies. Pittsburgh Dispatch, April 23, 1891, page 1. “There goes J. Palmer, the Pirate,” exclaimed a female voice, as a pair of dark side-whiskers and a chronic smile appeared above the stairway. Philadelphia Inquirer, June 4, 1891, page 3. 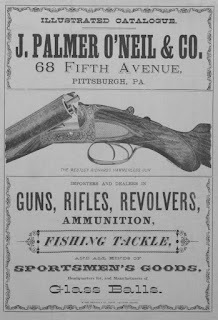 J. Palmer O’Neil made at least part of his fortune, appropriately enough, selling the sorts of items actual pirates might buy. Men of dishonor. Baseballists who disgrace the diamond represented in J. Palmer O’Neil’s Pittsburg pirates. Can they play honest ball? 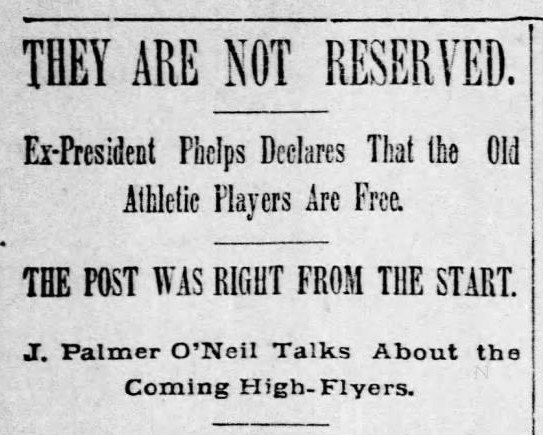 The public asks. . . . To-day O’Neil’s pirates, Pittsburg’s all star aggregation, or as best named, the contract jumper team, will make their appearance at the League park . . . .
Pittsburgh Dispatch, May 7, 1891, page 6 (citing comments appearing in the Cincinnati Post). To fully understand how and why Pittsburgh’s disputed contracts were widely considered “piracy,” yet nevertheless received the blessing of the league, requires a bit of historical context and an analysis of the technical minutiae of the rules governing professional baseball at the time. The business of professional baseball was barely twenty years old in 1890, and the now-familiar arrangement of professional baseball “leagues,” comprised of a set number of teams, competing on an equal basis, under standardized rules, on mutual schedules, was barely fifteen years old. The owners and the players were developing the business of the professional sports leagues, franchising and labor arrangements on the fly, without experience or historical precedent to guide them. It’s no surprise that there were a few missteps along the way. The Cincinnati Red Stockings toured the country in 1869 as the first fully professional team of baseball players. They were a competitive and commercial success, winning most of their games and spawning imitators in cities across a country that saw, for the first time, the potential skill-level of a team of dedicated, trained professionals. By 1871, a group of newly-professional teams organized themselves into a National Association of Professional Baseball Players. But the Association was not a “league,” as such; it was more of a professional association with a code of professional conduct. It standardized rules of the game and competition, but did not control scheduling, and there were few incentives for teams to abide by its rules. Captain Jack Sparrow of the Pirates of the Caribbean might have described its rules as “more of what you call a guideline than actual rules.” And, in any case, since any team could join the association by paying a $10 entrance fee, the number of teams swelled uncontrollably and the average level of play suffered as a result. To bring more order, stability and professionalism into baseball, eight teams in eight major cities joined forces in 1876 as the “National League,” the same National League that, alongside the American League, is part of Major League Baseball today. Two of its original teams are even still in the league, the Chicago Cubs (then known as the Chicago White Stockings) and Atlanta Braves (then known simply as the Bostons, later the Beaneaters, Boston Braves and Milwaukee Braves). Philadelphia Times, February 4, 1876, page 1. No club shall ever be admitted from a city of less than 75,000 in habitants, or from any city within five miles of the locale of any club in the League, thus giving the League club virtually full proprietary rights over the city to which it belongs. The fact that players could jump from team to team, season after season created player turnover and increased labor costs. Teams worried that they would lose their investment in finding and developing talent, and bidding wars for top-talent put upward pressure on player salaries. The league addressed the issues at an inter-league meeting in Buffalo, New York in 1878. The “Buffalo Agreement,”[vi] signed by the National League and six teams of the International League, introduced the first “reserve rule” in baseball. The rule, then widely referred to as the “five man rule”, gave teams the option of reserving the exclusive right to sign up to five players on their team for a subsequent season. We understand that the Cincinnati Club alone failed to take advantage of the “five men reservation” adopted by the League meeting at Buffalo, so that Cincinnati is likely to lose every good player it has. Kelly and the White brothers may go, but their places will not be easily filled. No wonder Cincinnati people get disgusted with base-ball. It’s enough to make any one sick to see players developed here, and as soon as they are useful see them go away to strengthen a rival Club. Why does not the Cincinnati Club take hold or step aside’ and give a clear field to another organization? The Buffalo Commercial, October 6, 1879, page 3. The National League met its first major rival in 1882, the American Association. But since all of its teams were in different cities (at least initially), it did not compete directly for paying customers with the National League. 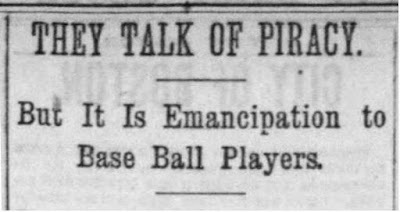 That changed in 1883, however, with each league fielding separate teams in Philadelphia, an arrangement that would play a role in the story of how Pittsburgh became the Pirates. The leagues also competed in the same markets briefly in New York (1883-1887) and Brooklyn (1890). Pittsburgh’s baseball team was a charter member of the American Association in 1882, where it played for five years, before switching allegiances to the National League in 1887. 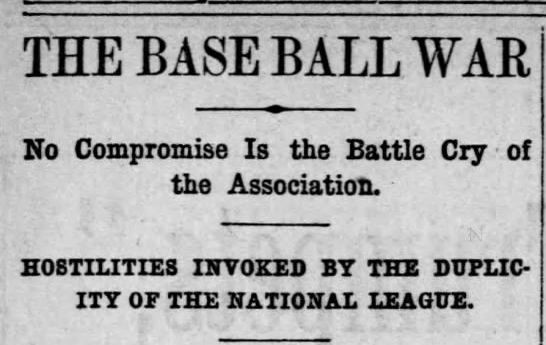 To avoid a competitive free-for-all that might harm both leagues, the National League and American Association entered into a “National Agreement” (or “Tri-partite Agreement,” the minor league Northwestern League having also signed on) before the 1883 season, setting out the rules governing the business of professional baseball. From 1883 through 1889, the Agreement maintained relative peace. Beginning in 1884, the champions of the two leagues even played a season-ending “World’s Series”, much like the current World’s Series played annually between the National League and American League since 1903. Every club shall have the right to reserve any of its players, not to exceed eleven in number, provided that they shall not force any of these players to play for less than $1000 a year. This is the old five-men agreement, extended in number to eleven, virtually the entire team, and with so much concession to the player that he cannot be beaten down to less than $1000 unless he agrees to play for that. But if the club offers him that sum he can go nowhere else. The Boston Globe, February 25, 1883, page 6. Now every club will have a chance to retain all its favorite players, and instead of clubs paying out $17,000 for a team and going into bankruptcy they will get the same team for $10,000 and get through. 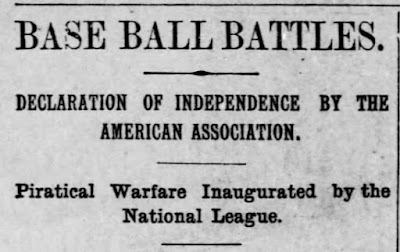 Never has the national game had such a glorious future before it as dawned when representatives of the thirty-one leading professional clubs clasped hands and banded their clubs together in a common brotherhood to protect themselves and foster the game of base ball. The Louisville Courier-Journal, February 20, 1883, page 3. Those players who, by the disbandment of the clubs with which they played last season, were in the market at the close of the season, found such an active competition to secure their services that they brought enormous prices at auction; two or three times their value to any club. They are aware of this fact, and also of the fact that long before the coming season closes they will be appraised at their true valuation, and will either play for a fair salary in 1884, or not at all. For this reason, the Buck Ewings and Johnny Richmonds are agitating a Players’ Protective Association as a means to counteract the reserve rule. Detroit Free Press, February 28, 1883, page 6. IV. On the tenth day of October in each year the Secretary of each Association shall transmit to the Secretary of the other Association a reserve list of players, not exceeding fourteen in number then under contract with each of its several Club members, and of such players reserved in any prior annual reserve list, who have refused to contract with said Club members and of all other ineligible players, and such players, together with all others thereafter to be regularly contracted with by such Club members, are and shall be ineligible to contract with any other Club, except as hereinbefore prescribed. Spalding’s Base Ball Guide and Official League Book for 1890, Chicago and New York, A. G. Spalding & Bros., 1890, pages 144-145. 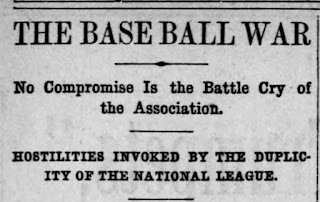 In 1885, the players finally did form their union, the National Brotherhood of Professional Base-Ball Players, but without any real leverage to wrest major concessions from the owners, their position never improved. It all came to a head before the 1890 season when the Brotherhood started its own league, the Players’ League, run by their own rules and without regard to the major leagues’ “reserve lists”. New York Times, November 5, 1889, page 8. Like the Founding Fathers, who risked execution for treason by signing the Declaration of Independence, many of the players who signed contracts to play in the Players’ League did so at risk of receiving baseball’s equivalent of the death penalty – the blacklist. The League and the Association viewed the entire Players’ League as pirates. [The Players] claim they have a perfect right after filling their contracts to start in business for themselves if they can get backing that suits them. Was it piracy when the league went in to the ranks of other clubs and carried off players who had signed contracts, and if I am not mistaken Brother C. [(Oliver Perry Caylor)] was a prime mover in that kind of business, as in the case of Mullane; does it depend on whose ox is gored?
. . . To subserve their interests [the owners] have dealt in base ball players much after the fashion of the old Southern slavedriver. They have trafficked in the players who have been sold among themselves ad libitum. Like the old slaves, the star players have been placed on the block and auctioned off to the highest bidders. With no redress, the players with whom it is “play or starve,” have fared hard. No matter the proficiency of the players, or their devices, they have been mercilessly cast to play wherever it has suited the sweet will of the magnates, who have thus kept them in subjection, and at the same time have grown rich on the blood and sweat of the hirelings. The slavery analogy may have been a bit overwrought. No one was forcing the players to play professional baseball. They could have gone home and work as haberdashers, farmers or clerks if they wanted to. But if they wanted to play baseball in the major leagues, their hands were tied. If they were named on a “reserve list” they had to play for that team, and none other, or risk the prospect of never playing major league baseball again. The Players League placed teams in seven of eight of the National League cities, putting it in direct competition with the League for fans and players. 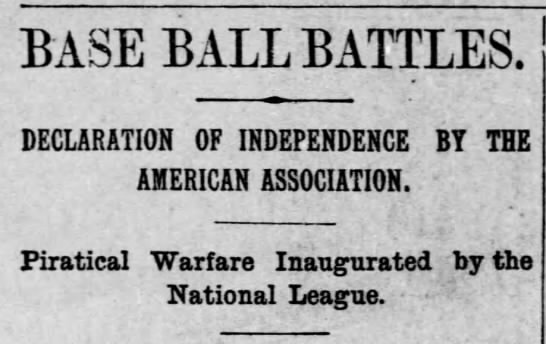 Competition was particularly fierce in Philadelphia, where there were already two major league teams, the National League’s Phillies and American Association’s Athletics. The Athletics went bankrupt before the season ended, several players left the team for non-payment of salaries and the team finished off the season with a twenty-two game losing streak. Los Angeles Times, September 17, 1890, page 4. To stop the bleeding, the Association took control of the franchise for the remainder of the season. The Association retained control of the franchise during the offseason, while looking for suitable new ownership. In early 1891, they would award the franchise to the Wagner Brothers, owners of the local Players’ League team who had tried to buy out the Athletics when they ran into financial difficulty during the season. In the interim, however, the front-office chaos caused by the ownership vacuum likely played a role in Bierbauer and Stovey being left off the Athletics’ “reserve list,” which, in turn, set in motion the sequence of events that would ultimately lead to Pittsburgh becoming “Pirates” a few months later. 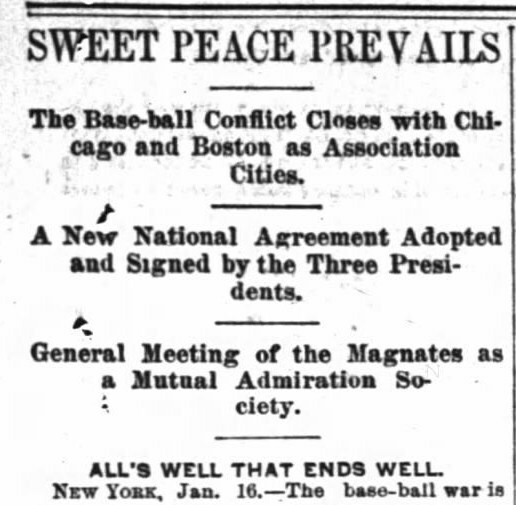 As the 1890 season ended, with the future of organized, professional baseball in doubt, one man single-handedly brought the three leagues together to negotiate a peaceful settlement to the conflict. Early reports of his efforts erroneously referred to him as Allen W. Thurman, Jr. or A. G. Thurman Jr., based on the fame of his father, Allen G. Thurman, a Senator from Ohio and close friend of President Cleveland. But the writers would soon learn his real name, and in short-order saddled him with a new nickname – the “White Winged Angel of Peace”. A Conference Likely Between Representatives of Rival Baseball Leagues.
. . . [O]ne thing is certain, Allen W. Thurman, Jr., a member of the Board of Arbitration, and one of the largest stockholders of the Columbus club, has been in the city for some time, and has had a conference with President day, of the New York National League club; Vice President Talcott, of the New York Players’ League club, and other luminaries of baseball. . . . Mr. Day said that he had a talk with a. G. Thurman, Jr., regarding the matter, and that the latter was very much in earnest about producing harmony. Pittsburgh Dispatch, October 4, 1890, page 6. When formal negotiations began less than a week later, Allen W. Thurman had a new nickname, the “White Winged Angel of Peace”. [vii] Four months later, however, after voting with the National League to award Bierbauer and Stovey to Pittsburgh and Boston, respectively, his name would be mud. In the interim, the leagues continued to meet periodically to hammer out the details of a final settlement. With peace on the horizon, teams continued with business as usual to prepare for an upcoming season, including the usually routine business of submitting their list of reserved players. The Athletics have lost the right to their old players, so that Larkin, Cross, Brennan, Bierbauer, Weyhing and Stovey can walk over this free land without shackles and become the prey of any club – national agreement or otherwise. Pittsburgh Daily Post, October 20, 1890, page 6. The stop-gap management team put in place to shepherd the team through its post-bankruptcy ownership vacuum appears to have listed only their current players, while neglecting to name the additional “players reserved in any prior annual reserve list, who have refused to contract,” as permitted under the National Agreement. The six missing players all played in the Players’ League during 1890; Weyhing and Bierbauer for Brooklyn, Brennan and Larkin for Cleveland, Stovey in Boston and Cross in Philadelphia. Weyhing, Larkin and Cross would play for Philadelphia in 1891, and Cross would leave baseball for good. Bierbauer and Stovey, however, took advantage of the situation to seek greener pastures. The Daily Post kept an eye on those players, posting a similar notice in December. J. Palmer O’Neil may have been taking notes. Pittsburgh Daily Post, January 26, 1891, page 6. The Athletic Club players – Weyhing, Cross, Larkin, Bierbauer, Stovey and others – will be at the disposal of the American Association, to be assigned probably to those securing the Athletic club’s franchise. 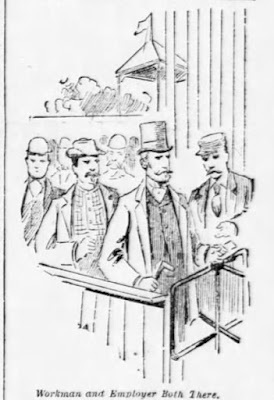 Philadelphia Inquirer, December 4, 1890, page 3. [T]he players who deserted from the Athletic Club will be returned to the Association, and the Wagner Brothers [(new ownership team)] will secure the nucleus of a good team if Stovey, Bierbauer, Weyhing, Cross, Robinson, McMahon, Purcell, Shafer, Larkin and O’Brien are awarded to them. Philadelphia Inquirer, December 21, 1890, page 3. Last October, after the reserve lists were published, The Pittsburgh Post took the stand and has maintained it ever since, that the old Athletic players were not reserved and could sign wherever they pleased. That The Post was right is conclusively proven by the following special from Louisville: President Phelps received a telegram from J. Earl Wagner of Philadelphia, asking if Larkin, Stovey, Bierbauer and Cross had been reserved by the old Athletic management. This, it is thought, is a test to the validity of Bierbauer’s contract with Pittsburgh. President Phelps telegraphed that they were not reserved. Pittsburgh Daily Post, January 27, 1891, page 6. Chicago Inter-Ocean, February 6, 1891, page 6. 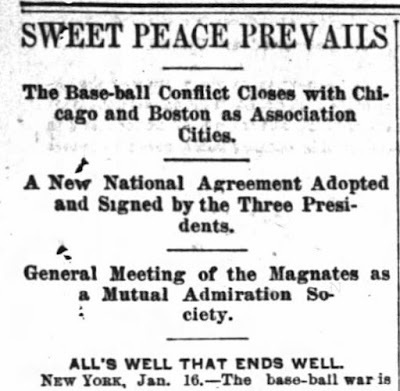 In mid-January 1891, before Pittsburgh and Boston signed Bierbauer and Stovey, the National League, American Association, Western Association (a minor league) and remnants of the Players League all met to sign a new National Agreement and resolve several outstanding issues. Boston and Chicago would receive new American Association franchises, with those franchises going to the Players’ League teams from those cities. They also awarded the Philadelphia Athletics’ lapsed franchise to the Wagner Brothers, owners of the local Players’ League team. The final compromise also addressed the treatment of players who had played in the Players’ League. To clear the air, they reset the clock to the status quo ante from before formation of the Players’ League, with teams permitted to “reserve” players for 1891 who had been on their reserve lists for 1890 season, regardless of where the players played during the chaotic 1890 season.
. . . All the players’ League sheep must return to the folds, where they were reserved, but undoubtedly many of them will be allowed to stay where they are. . . . The Inter-Ocean (Chicago), January 17, 1891, page 2. But since the deadline for submitting the “reserve lists” had long since passed, the die was already cast. 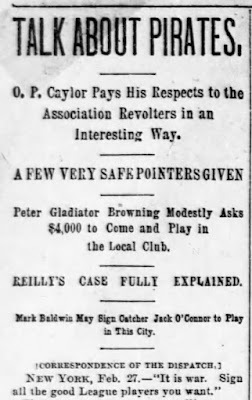 Unless the league made some equitable exception, Philadelphia, which had failed to reserve all of the players it could have reserved, may have already lost their claim to Bierbauer, Stovey and the others, despite the leagues’ expressed intent to return all of the old players to their old teams. Pittsburgh argued the letter of the law. Philadelphia argued the spirit of the law. The stage was set for a showdown at the next baseball meetings to be held in February. 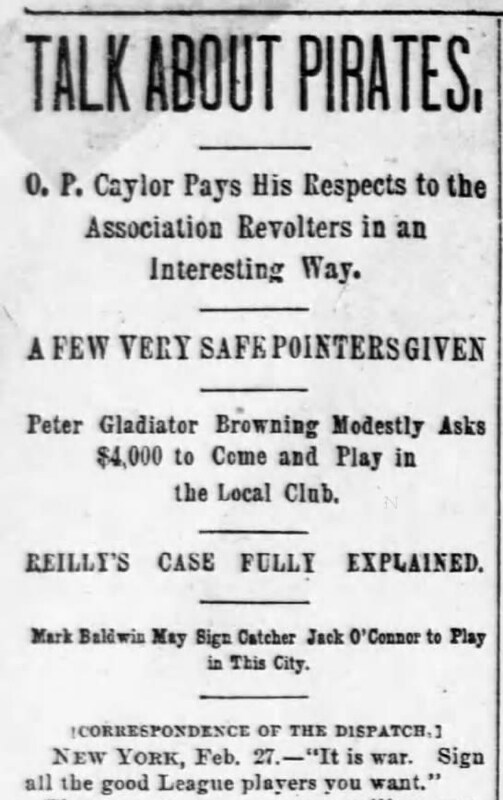 At the baseball meeting in mid-February 1891, the National Board of Control for baseball addressed the question of whether Pittsburgh and Boston could sign Bierbauer and Stovey over the Philadelphia Athletics’ compelling, if technically defective, “reserve rule” claim. The American Association’s new President, Allen W. Thurman, that “white-winged angel of peace,” voted with the National League (and consistent with the opinion voiced by a former President of the Association) to uphold the disputed contracts. The board also awarded Connie Mack to Pittsburgh under less controversial circumstances (Mack had been under a “personal” contract with a Boston baseball executive hoping to land a new Association franchise, not a sanctioned league contract; he was therefore not subject to the “reserve rule” or the National Agreement). Chicago, Feb. 14. – It was not until this afternoon after a session continuing all day yesterday and until 3 o’clock this morning that the Baseball Board of Control announced its decisions in the famous players’ cases. . . . In summing up, the Board said: Undoubtedly Pittsburg has the legal right to the men, but morally it has not. It ought to withdraw its claim, but as it does not we must reluctantly decide in favor of Pittsburg. 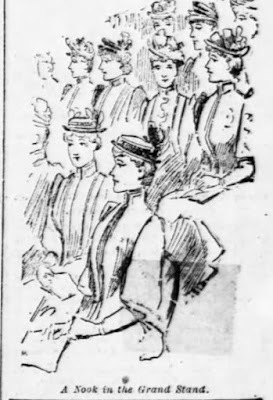 Pittsburgh Dispatch, February 15, 1891, page 6. New York, Feb. 21. – Once more the base ball world is in a ferment. The American Association has withdrawn from the national agreement, Allen W. Thurman has been deposed from the presidency . . . . The Association was to have all its former players, place clubs in Chicago and Boston, and, after each League club had “reserved” fourteen players all the others were to be thrown into the hands of the National Board for apportionment. 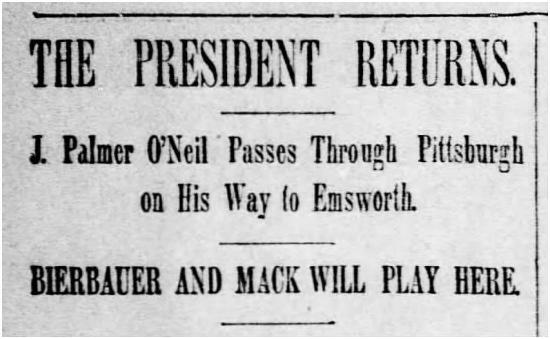 Within ten days J. Palmer O’Neil of the Pittsburg League club signed Louis Bierbauer, the second baseman, who in 1889 left the Athletics to play with Ward’s Brooklyn wonders. Mr. O’Neil discovered that by an oversight of the American Association’s President no “reserve” list has been promulgated, and through this technicality he thought he could obtain the players who, according to the spirit of the Fifth Avenue Hotel settlement, should have gone to the Wagner Bros.’ Philadelphia team. Then the Boston League Club secured Harry Stovey in the same way. The Association men were incensed at this breach of faith, and when President Thurman, their member of the National board, voted against them and with the League, sustaining the piracy of the Boston and Pittsburg clubs, their rage knew no bounds. 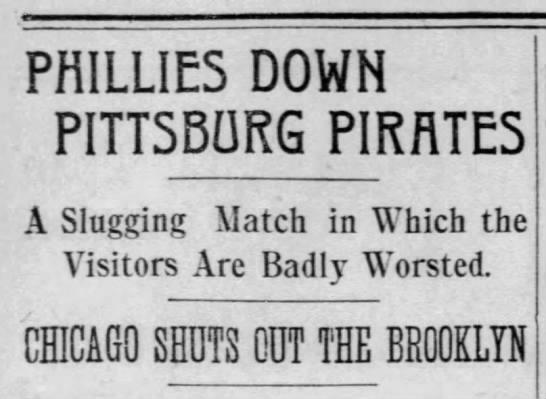 But even though the American Association was upset with Pittsburgh’s and Boston’s “piracies,” they were perfectly willing to fight fire with fire with piracy of their own. That was the message, you will remember, which flashed across the wires between Chicago and Boston about ten minutes after the National Board announced its decision in the Bierbauer-Stovey case. The message was directed to Mr. Prince[viii] in Boston and was signed by Arthur Irwin[ix] in Chicago. Pittsburgh Dispatch, March 1, 1891, page 6. “We are pirates now. . . and have hoisted the black flag against the National League for the good of base-ball. The American association is composed of a precious set of fools when it gets started. . . . The American association simply takes the place of the Players’ league. It is at liberty to take players anywhere and everywhere. It is a piratical ship with the black flag up and the torch lighted. It regards no law, no rule. Every base ball association is its prey and every league its feeding ground. Nebraska State Journal (Lincoln), February 23, 1891, page 2. When the Association hoisted their black flag, their idea of “piracy” may have been limited to the signing of “reserved” players. They do not appear to have considered or anticipated the consequences their decision would have on the continued validity of contracts signed before they left the Agreement. Princeton, N. J., Feb. 26. – Columbus Base-ball Company. Sirs: I have this day signed with the Pittsburg National League club. . . . My contract with Columbus was broken by your club breaking the National agreement. . . . I am very sorry that the association did such a foolish move by breaking the National agreement. If the association and league compromise I will be glad to play in Columbus again, but not otherwise. Chicago Inter-Ocean, March 1, 1891, page 2. Once again, J. Palmer O’Neil was the first person to recognize and aggressively exploit this “loophole” (if that’s what it was), sending his agents on a cross-country signing spree. They tracked down third-baseman Charlie Reilly at his home in Princeton, New Jersey on February 26, pitcher Mark Baldwin in Pittsburgh on the 27th, pitcher Scott Stratton in Middleborough, Kentucky on the 28th and catcher Jack O’Connor in St. Louis, Missouri on March 1. 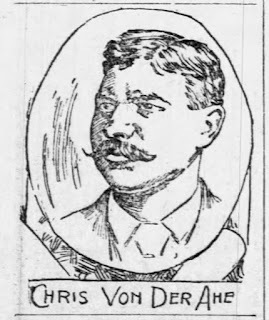 Pittsburgh’s agent in St. Louis was also hot on the trail of the St. Louis Browns’ pitcher, Charles “Silver” King at the time – that is, before his arrest at the behest of Browns' owner Chris Von der Ahe (more on that later). All four new signees had already signed contracts with American Association teams, Reilly, Baldwin and O’Connor with Columbus, Stratton with Louisville and King with St. Louis. Charles “Silver” King eventually did sign a contract with Pittsburgh, but not until the season began a couple months later. Jack O’Connor would later change his mind and return to Columbus before the season opener. It is, it is a wonderful thing, to be, to be a Pirate King! And it was a wonderful thing. Like the Players’ League before it, the American Association collapsed after the 1891 season, leaving the National League as the one and only major league for a decade, before the emergence of the American League established the two-league equilibrium that persists to this day. It may have been a wonderful thing to be a “Pirate King,” but it was also dangerous. Several of the Pirates’ contract signings involved physical risk, legal jeopardy and enough drama to fill a Gilbert & Sullivan opera. Ned Hanlon, then managing Pittsburg, went to Erie in the depth of the Winter to secure a contract from Bierbauer. He found him on Presque Isle Peninsula, his favorite “hang-out.” Hanlon had to cross the ice on the harbor in a bitter storm, but he finally reached Bierbauer’s shack and before leaving had secured his signature to a contract to play with Pittsburg. Alfred Spink, The National Game; America’s leading out-door sport, St. Louis, Missouri, National Game Publishing Company, 1910, page 192. Erie, Pa, March 6. – Bierbauer is not at all satisfied with the treatment he is receiving from the Pittsburg management. He has signed only a conditional contract, and feels at liberty to sign wherever he please, and will do so if Pittsburg does not straighten matters soon. Erie, March 6. – Edward Hanlon, manager of the Pittsburg Ball Club, came to Erie last evening and this morning consummated his deal with the famous second baseman at $4500. Sporting Life, March 7, 1891, page 1. The Pittsburgh Press, March 2, 1891, page 6. A special to the Baltimore American from Cincinnati says: “Mark Baldwin and Charlie Reilly, the contract jumpers, were not with the team. They came on ahead. As soon as they struck Ohio soil they repaired to the toilet-room of their sleepers and changed their clothes. They disguised themselves, and returned to their seats looking very much like two of the rustics in ‘Old Jed Prouty.’ Baldwin wore a set of side whiskers very much like J. Palmer O’Neil’s, while Reilly had on a pair of Galways. In this way they rode through the State and escaped the vigilant detectives who want them to appear in a Columbus court for contract breaking. The Buffalo Enquirer, April 23, 1891, page 3. Contract jumper Mark Baldwin, a Pittsburgh native, took an active role in seeking out and signing other new players for the team. In early March, 1891, he tracked down his old, trusted catcher on the Columbus team, Jack O’Connor, at his home in St. Louis, Missouri. And while there, he also sought out pitcher, Charles “Silver” King, who was then under contract with Chris Von der Ahe’s St. Louis Browns. Von der Ahe did not take it lightly. President Von der Ahe learned of what was in progress soon after Baldwin arrived here, and about 1 o’clock yesterday morning he hauled Chief of Detectives Desmond out of bed and told him of what was going on. He asked Desmond to run Baldwin in on the vagrancy clause . . . and they went chasing around hotels after him. Baldwin seems to have caught on to the game, for he kept shady all of last night. This morning President Von der Ahe . . . called on Assisting Prosecuting Attorney Estep, and asked for a warrant for Baldwin’s arrest on the charge of conspiracy. The Courier-Journal (Louisville, Kentucky), March 4, 1891, page 2. Baldwin was about town to-day boasting that Von der Ahe’s talk about having him arrested for conspiracy was all buncombe. He was around the Laclede Hotel all afternoon playing billiards and enjoying himself nicely, when Chief of Detectives Desmond tapped him on the shoulder and told him he was wanted at the Four Courts. . . . Judge Claibourne . . . was not around at the time, and as he was the only person authorized to receive bond Baldwin could not have procured his release even had he been able to do so. As a result he was locked in jail, and the probability is that he will stay there for at least twenty-four hours. 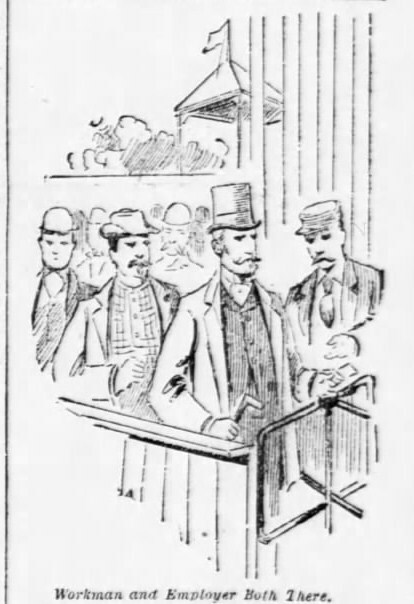 New York World, March 6, 1891, page 7. The Von der Ahe outrage upon Mark Baldwin has been thrown out of court. 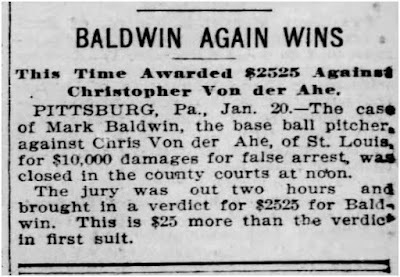 Now, if the Pittsburg club officials do not back Baldwin in making Von der Ahe pay for his little piece of fun, they do not deserve the patronage of Pittsburg people. . . . The Sporting Times does not approve of Baldwin’s methods, but the attempt to disgrace him and his club by dragging him into the criminal courts was a thrust at the life of the national game and should be punished if there be law to punish false arrest and imprisonment. Pittsburgh Dispatch, April 12, 1891, page 6.
. . . whom he charges with malicious prosecution. The suit grows out of the arrest of Baldwin on March 5, upon an information taken out by Von der Ahe, charging him with conspiracy with O’Neil and others to bribe Charles F. King to abandon the Browns and join the League team. Baldwin alleges that the arrest was without probably cause and made with malicious intentions. 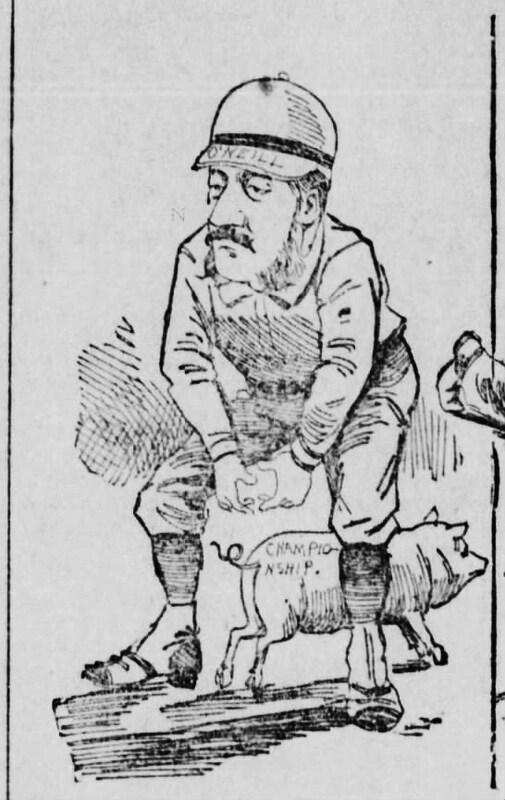 Philadelphia Inquirer, January 27, 1897, page 4. Von der Ahe promptly refused to pay, but that didn’t prevent Baldwin from trying to collect. 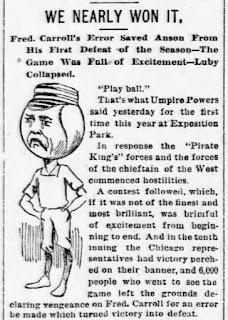 On June 25, 1897, he reportedly attached the gate receipts from the game, in Pittsburgh, between Pittsburgh and St. Louis (which had since switched over to the National League) – attendance 1800. [xiii] It is not clear whether or how much Baldwin recovered from that game, but whatever it was, it was not enough. 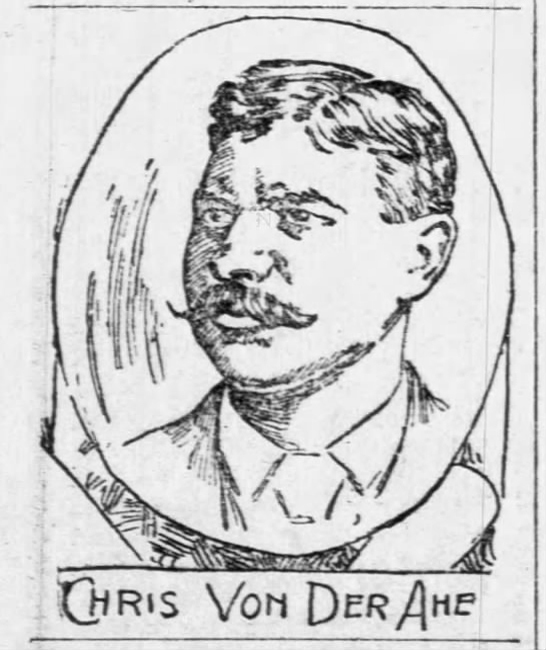 Von der Ahe stilled owed him money in 1898, prompting more decisive action. 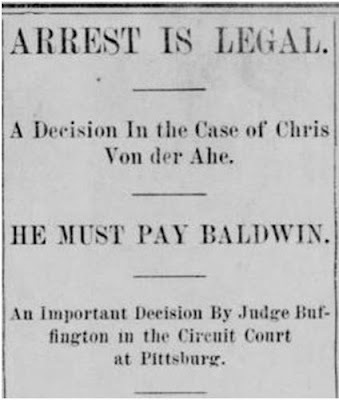 Baldwin hired his own “detective” (essentially a bounty hunter) who kidnapped Von der Ahe in St. Louis and dragged him back to Pittsburgh to pay. This time Von der Ahe alleged false imprisonment. But on the facts of the case (Baldwin had a valid, unsatisfied judgment against Von der Ahe) and under the laws in effect at the time, Baldwin prevailed. Sedalia Weekly Democrat (Missouri), February 17, 1898, page 3. I’m not so sure kidnapping someone who owes you money would be a good idea today – don’t try this at home. 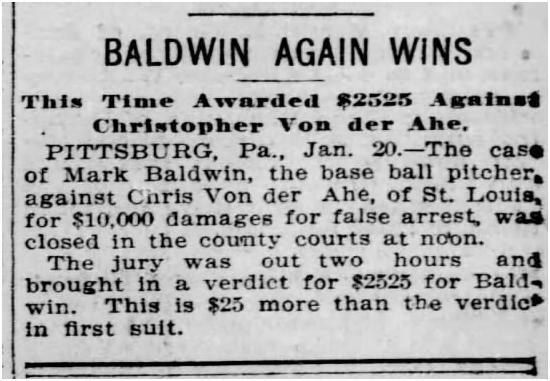 The Baldwin-Von der Ahe damage suit which was decided against Von der Ahe several months ago was ended yesterday by the attorney of the St. Louis baseball magnate paying the amount of the Baldwin judgment, in the neighborhood of $3,000, together with the costs, something over $1,200. Detroit Free Press, September 7, 1898, page 6. Nebraska State Journal (Lincoln, Nebraska), February 12, 1899, page 14. Surprisingly, perhaps, the Pittsburgh Pirates were not the first major league team called the “Pirates”. 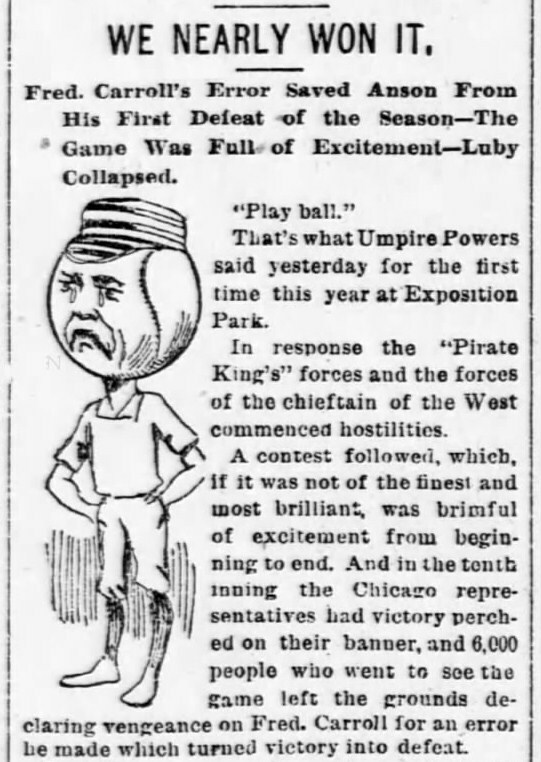 The “Chicago Pirates” played in the short-lived Players League during their first and only season in 1890. The apparent origin of their name, however, was a bit more mundane. It is tempting to assume that they selected the name because the Chicago Pirates “stole” seven players from the 1889 Chicago White Stockings team as part of the “Baseball War” sparked by the Players’ League. [xiv] But Chicago’s “piracy” was neither unique nor particularly remarkable. Nearly every Players’ League team “stole” several players from National League or American Association teams in their city. Of course, it wasn’t “stealing,” as they were forming an entirely new and independent league, not subject to the same agreement or rules by which the other league played. Players League teams in New York and Philadelphia even stole their nicknames from their local rivals, the Giants and Athletics, respectively. Before condemning these teams for stealing nicknames, note that team nicknames, for the most part, were not then considered valuable, unique, immutable trademarks, as they are now. Teams were most frequently referred to as the plural of the name of the city they played in, such as, for example, the New Yorks, the Philadelphias, the Bostons. Sportswriters and fans, however, applied colorful nicknames at their pleasure. In some cities, the history or culture of the place lent itself to a nickname; the Boston Beaneaters (Boston baked beans), the Washington Senators (legislature) or Philadelphia Quakers (William Penn’s tribe). In other cities, nicknames came and went with uniform changes (St. Louis Browns, St. Louis Maroons, St. Louis Cardinals, Chicago White Stockings, Chicago Black Stockings), or player changes. The Cleveland Naps, for example, were captained by Napoleon Lajoie, whose departure in 1915 created the nickname vacancy which was filled with a longer-lasting replacement, the Cleveland “Indians”. In Chicago, the name Anson’s Colts combined the name of its manager with the fact that many of their players were young). In Brooklyn, several members of the team got married during the same off-season, leading to the name, Brooklyn Bridegrooms. Social conditions in Brooklyn brought a new name a few years later, the Brooklyn Trolley Dodgers, when hundreds of people died at the hands a new-fangled, fast-moving, yet silent killer – electric trolleys. The admission of expansion teams to a league frequently resulted in the new teams being dubbed “Infants” or “Babies” for a season or two. In 1895, after several rain-outs, one sportswriter tried renaming the Phillies, the “Rainmakers”. In 1890, the Chicago Players’ League team was known by two different nicknames, one new and one old, and both related to the team uniform’s color scheme. The home uniform will consist of white shirts, trousers and stockings of jersey cloth, with black caps and belts, and a narrow black ribbed seam on the side of the trousers. The word Chicago will be lettered on the breast of the shirt in plain black letters. The other uniforms will be made of expensive black cloth, with white stockings, belts and caps. The lettering will also be in white. Each suit will have black cloth jacket. The Times (Philadelphia, Pennsylvania), January 12, 1890, page 2. The name “White Stockings”, adopted months before the season started (and weeks before the uniform colors were announced),[xv] was likely an intentional nod to an earlier name for the local National League team (now the Cubs), who had been known by that name for several years, before changing their socks and becoming the “Black Stockings” (not to be confused with the “Black Sox” scandal of 1918). Rank Decisions Help the Pittsburgs to Defeat Comiskey’s Men. Pittsburg, Pa., April 21. – [Special.] – The laurel wreath of victory which adorned the camp of the Pirates, as the Chicago team has been dubbed on account its colors, has been supplanted by crepe tonight, and gloom reigns supreme. Chicago Tribune, April 23, 1890, page 2. The Chicago Players Get Their Salaries Minus 10 Per Cent. Chicago, Dec. 30. – The Chicago White Stocking club is no more. Its grand stand and chairs, the lease of its park, and its insurance policies, its books and papers, its contracts with players, belong to the League club. Pittsburgh Daily Post, December 31, 1890, page 6. Chicago’s baseball “Pirates” were not the first “Chicago Pirates.” Although it’s unclear whether these earlier pirates have any connection to the baseball team’s name, the story dovetails nicely with the musical origin of the “Pittsburgh Pirates.” And since the earlier “pirates” were in the publishing industry, it is at least hypothetically possible that name may have influenced some newspaper editor to apply the name to the baseball team, even if the black uniforms played a role in the decision. For more than a decade before the “Chicago Pirates” played baseball in 1890, Chicago-based publishers were internationally known as “Chicago pirates,” based on their reputation for pirating copyrighted books and plays. Ironically, they famously pirated plays written by Gilbert & Sullivan, whose Pirates of Penzance inspired the naming of the Pittsburgh Pirates. John J. Ryan, the person who was arrested Tuesday, and lodged in jail on the charge of conspiring to injure the property and business of Mr. McKee Rankin by surreptitiously procuring and selling copies of the play called “The Danites,” was yesterday morning taken before Justice Meech for examination. . . . [I]f our Chicago pirate can be convicted on a criminal charge, the fact will be regarded with considerable satisfaction as establishing a precedent and avoiding much unprofitable botheration in the future. The Chicago Tribune, February 15, 1878, page 8.
. . . Owing to a class of men who are, I believe, known in their own country and by their brethren of the trade as Chicago pirates, it is almost impossible for the British author to derive any pecuniary advantage from the publication of his works in the United States . . . .
[A] number of firms have recently sprung up in Chicago and other American cities who seize upon the book as soon as it appears in the States, and, having the resources of great printing establishments at their command, in three or four days flood the market with cheap editions at 15c. and even less. . . . This system of piracy has completely ruined the chance of the English author . . . . The London Times, August 13, 1880, page 12. In China I read that there is a perpetual copyright for an author’s productions. The infringement of it is punished by a hundred blows on the feet and transportation for three years. The first penalty is admirable; but I doubt whether the second would always have a deterrent effect. Would a Chicago pirate-publisher for example live in Chicago if he could help it? Sheffield and Rotherham Independent (South Yorkshire, England), June 11, 1881, page 9. Gilbert & Sullivan’s first run-in with American copyright pirates came in 1879, when more than 100 companies mounted unauthorized productions of their first pirate opera, The HMS Pinafore, shortly after its 1878 London opening. To avoid a similar fate for their next production, they staged The Pirates of Penzance in New York City before its London debut, thereby arguably securing copyright protection under American copyright law of the time. Detroit Free Press, July 1, 1885, page 1. Puck, Volume 18, Number 468, February 24, 1886. You bet your life: The Law – that’s Me. W. S. Gilbert, himself, appears as one of the aggrieved Brits (on the right side – moustache, no beard, directly above the Jack-in-the-Box). [i] John McCollister, The Bucs! : The Story of the Pittsburgh Pirates, Lyons Press, 2016, page 9. “The spokesman for the American Association was much more emotional in his accusations. “The act of the Pittsburgh Club is piratical,” he shouted. [ii] Thomas B. Kalbfus, publisher of the Sunday Herald newspaper in Washington DC and secretary of the newly-organized American Association team in that city. [iii] I found only one example following an early-season road loss to Chicago. Although it was consistent with linguistic norms of the day, it might raise a few eyebrows today, or at least remind one of Dr. Tobias Fünke in the first episode of Arrested Development. [iv] The Boston Globe, November 4, 1889, page 5. [v] Philadelphia Times, February 4, 1876, page 1. [vi] Chicago Tribune, April 21, 1878, page 7. [vii] Pittsburgh Dispatch, October 10, 1890, page 6. [viii] Charles A. Prince was the director of the Boston Players’ League team that had recently switched over to the American Association. [ix] Arthur Irwin was a player/manager for the Players’ League team in Boston that had recently switched over to the American Association. [x] Pittsburgh Daily Post, May 23, 1895, page 8. [xi] Chicago Inter-Ocean, May 4, 1894, page 5. [xii] Philadelphia Inquirer, January 27, 1897, page 4. [xiii] Burlington Free Press (Vermont), June 26, 1897, page 2. 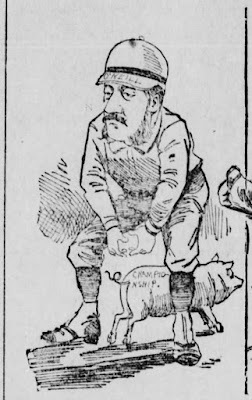 [xv] “The Chicago Brotherhood team is to be called the White Stockings.” The Buffalo Express (Buffalo, New York), November 17, 1889, page 10; The Threads of Our Game, 19th-century Baseball Uniform Database.